Located in the Central Visayas region, Bohol is a 1st provincial income class island province of the Philippines. These provinces are classified accorded to average annual income, which means that the residents of Bohol, on average, earn 450 million Philippine pesos per year. This is the tenth largest island of the Philippines, and it is a popular tourist destination, featuring beaches, resorts, and the world-famous Chocolate Hills. 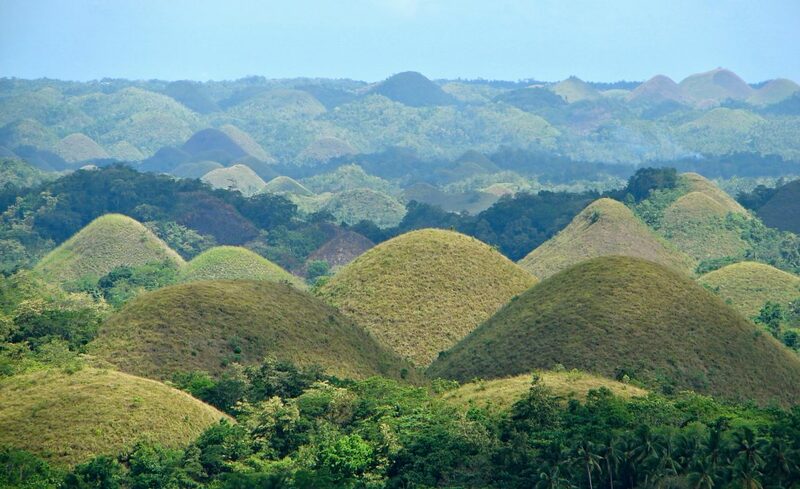 The Chocolate Hills are a strange geological formation. There are at least 1,260 hills, but estimates have expanded to the potential for almost 1,800 within the 20 square mile range. Though usually covered in green grass, they turn brown—like chocolate—during the dry season. The Hills are primarily conical and almost symmetrical, giving them an eerie appearance. The structures themselves are actually grass-covered limestone, which explains the weird, almost extra-terrestrial shape. Several legends explaining the formation of the Chocolate Hills exist in local folklore. In the most popular, two feuding giants hurled rocks, boulders, and sand at each other for several days. After growing tired, the giants forgot their feud and became friends, leaving the Chocolate Hills behind. Two of the known 1,260 hills have been developed into resorts for tourism, and several viewing stations exist for tourists to glimpse this strange landscape. In 1988, the National Committee on Geological Sciences declared the Chocolate Hills a National Geological Monument to recognize its special characteristics, scientific importance, uniqueness, and high scenic value. They are one of the country’s protected areas. In May of 2006, the Department of Environment and Natural Resources submitted the Chocolate Hills to the UNESCO World Heritage for inclusion.